Learn how to play the melody of Amazing Grace on your one-string Canjo! Learn the melody for one of the oldest nursery rhymes on your One-String Canjo! In this article we present tablature the “Battle Hymn of the Republic” for your One-String Canjo, brought to you by The American Canjo Company. We have also given you the first verse and chorus for the song, which can then be used for the rest of the verses of the hymn. This song is perhaps the best one ever recorded by Tom Petty. It has a very simple melody that is easy to play on the canjo. Click the Read More link to see the full tab. The rest of the verses can be found on any of the popular song lyrics sites. Now you can learn one of the most recorded Gospel songs on your One-String Canjo! When I die, hallelujah by and by, I’ll fly away. To learn more about this classic American song, and to find more verses, check out this Wikipedia article. There’s a bright and a sunny side too. The sunny side we a-l-so may view. It will brighten all the way, if we keep on the sunny side of life. Let It Be by The Beatles, arranged for one-string canjos. 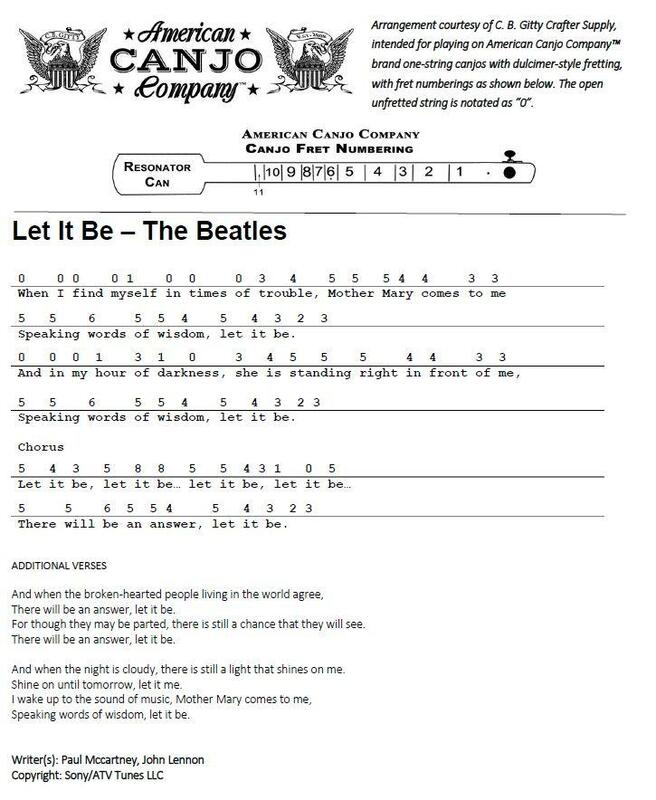 This is one of the most well-known and best-loved of the Beatles’ songbook, instantly recognizable by classic rock and roll fans all over the world. This arrangement is presented by the American Canjo Company and C. B. Gitty Crafter Supply. Be sure to check out all of the unique handmade canjos available from the American Canjo Company! To learn more about this beloved children’s song, check out this Wikipedia article.